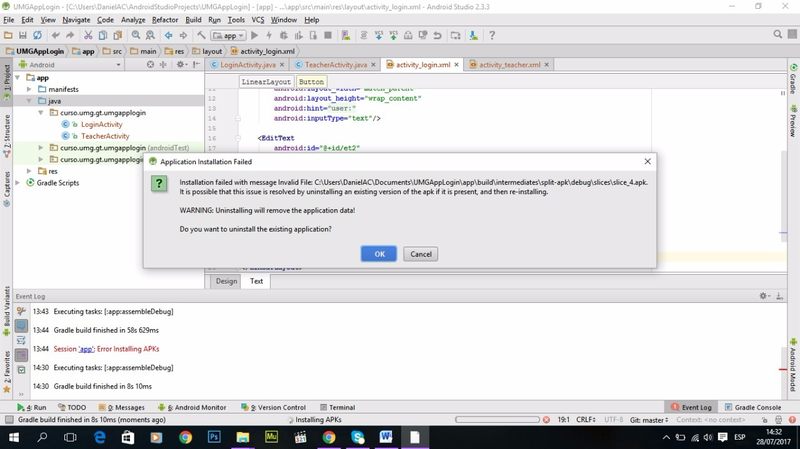 This is not an error in your application or Android Studio , it is a warning that indicates that the installation of the .apk "failed", because you have a version of the application that was signed with another keystore, probably it is an application of the playstore or upload in another pc. If you accept, you simply allow you to delete the current application and install the one that Android Studio generated. If you accept and decide that the current version is overwritten and then try to do it again, the message would no longer be shown as the .apk that you try to upload was signed with the same keystore as the one you installed (in this case the debug keystore). As an extra comment: the word "error" is not shown in the text indicated by the dialogue. To complement the response of @Jorgesys, not only is the application installed on the mobile key differently, it usually occurs when you change flavors for compilation, in some cases, for each flavor different key is handled, and when compiled to debug, use the key specially generated for that flavor and if you change for release, it will use the key of that flavor, just be careful where the connection url is pointing, so give it with faith, to uninstall the app so that it Install the app you are compiling.